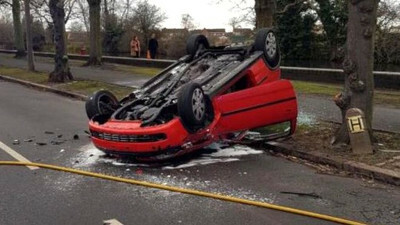 THE driver of his crashed car leaped into the Erewash Canal to escape police. The motorist, who was being chased by the police had crashed into five cars before turning the car over, clambering out then leaping into the Erewash Canal at Sandiacre, Alan Tilbury reports. But the police caught up with him and he was arrested after being dragged out of the canal and taken into custody on Saturday afternoon. He left a woman and a baby in the car who had to be taken to hospital for treatment, but were later released having had no serious injuries.